The following information was taken, with permission from: www.travellernottourist.com. For further information, please visit their website. 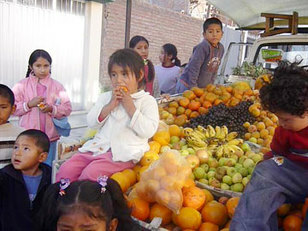 To help, in co-ordination with the government, the civil population which is socially, economically and morally deprived in the Arequipa region of Peru and the towns surrounding it, and specifically the children, especially those under the age of 8, who are most deprived of all types of attention (love, security, adequate nutrition, education, health etc). At the orphanage they offer integral care for those children under the age of 8 who have lost one or both parents, been morally and/or materially abandoned (eg by being left alone in their homes or whose parents do not care for them adequately) and/or who are at social risk (because they have parents who are drug addicts, alcoholics, delinquents etc). To guarantee the calm and harmonious development of the children in relation to protection, care, feeding, education, early stimulation and medical assistance. To guarantee to uphold the internationally accepted and recognized rights of the children whilst providing an adequate environment for their normal physical, spiritual and psychological development. The orphanage is run by full time volunteers (they only get food and board for their work there). It works with the government who sends them children (but not money or resources). The director places great emphasis on trying to get the children back into their family home (when it is safe to do so) or, where this is not possible, an extended family home with adoption as a last resort. The children range in age from under one year to 10 years old and they cater for both girls and boys. Reasons for the children to be in the orphanage vary from one or both parents being absent to the child having been deemed to be "at risk". Some children have been found abandoned on the streets. Development of the children is taken very seriously and includes mental, emotional, spiritual and physical well-being although it should be noted that any religious education is very subtle and more about general morals rather than bible studies. Traveler Not Tourist's objectives there are to enrich the environment for the children by spending quality time with them (as the carers do not always have time to do this), teaching them English, arts etc and playing with them whilst also providing respite for the full time workers by undertaking domestic chores such as washing, ironing, cleaning and cooking. All volunteers are required to do some domestic chores - this is a very important aspect of our work supporting the permanent, full time, local volunteers at the orphanage and ensuring that the children have a safe and healthy environment to live in. Every month or so a "Special Saturday" visit or outing for the children is arranged, in which all volunteers are welcome to participate.